Initial assessment is the most vital step in managing a patient’s health. As such, extracting as much information and achieving a broad road map of the arterial anatomy is crucial for proper arterial and vascular assessment. 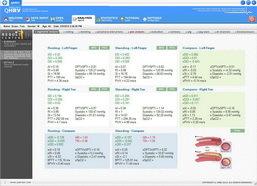 Dantest Arterial Vascular Assessment measures blood pressure uses the identical standard as conventional arm cuffs. While the traditional arm cuff method just measures blood pressure, the Dantest Arterial Vascular Assessment is a powerful measure which provides further insight into arterial stiffness. 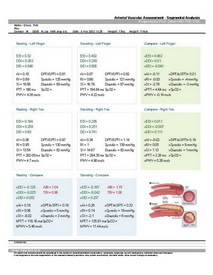 The information deduced from the Dantest Arterial Vascular Assessment is invaluable for detecting risk factors and facilitating the identification of patients who may be at risk for cardiovascular events. Studies have shown that the Arterial Stiffness Index (ASI) illustrates a strong correlation between the functioning and integrity of coronary arteries and atherosclerotic lesions. This particular connection is significant in that atherosclerotic lesions are fatal yet may remain asymptomatic for decades. Over 60 million Americans carry these life-threatening issues so isolating high-risk individuals is most valuable. Peripheral Artery Disease (PAD) is a dominant concern for physicians and it is intrinsically linked to arterial health. PAD is the occlusion of arteries due to the buildup of fatty, cholesterol deposits called plaque lining the interior of arteries. As the formation of plaque accumulates, the arteries narrow, stiffen and decline in functionality. This reduces blood flow, usually to the legs and, if left to worsen, can lead to tissue death or even amputation. Research estimates that eight to 12 million people are affected by PAD in both the U.S. and Europe. Like many other cardiovascular diseases, over three quarters of the population that develops Peripheral Artery Disease (PAD) do not show symptoms. Patients with PAD have an increased risk of stroke, heart attack and ischemic attack and PAD patients are six times more likely to die from cardiovascular disease within 10 years of being diagnosed versus healthy adults. Dantest Arterial Vascular Assessment enables specialists to isolate issues, track problems and manage patient health using noninvasive, oscillometric readings that are performed automatically and easily. 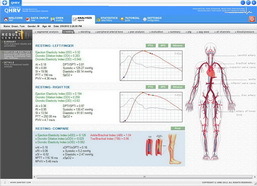 Segmental pressure analysis is essentially a blood pressure measurement taken at various different locations along the leg. This type of test is usually performed if there is claudication in the leg since this symptom is usually indicative of arterial narrowing. Segmental pressure analysis permits a in-depth analysis of wave form variation in order to determine the level of arterial obstruction. Reactive hyperemia or treadmill studies then show the extent of obstruction by indicating the time required for blood flow to resume to normal after cuff removal. This analysis is also used to assess circulation between the ankle and toes using a photosensitive transducer and ankle cuff. This method uses a photoplethysmograph as opposed to a Doppler ultrasound. The cuff is inflated to record the wave form then deflated to collect the systolic transmetatarsal pressure reading. To obtain individual toe pressures, smaller cuffs may be wrapped around the toes then transducers placed distal to the cuffs. 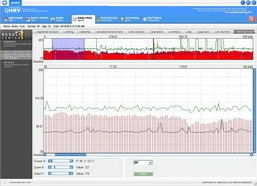 The results of the pressure analyses provide important insight into a patient’s current state as well as their potential to cope with future issues like healing from amputations. Typically, toe pressure is 60% of systemic pressure. This reading, along with and transmetatarsal pressures correlates with a patients potential for healing prior to amputations. A pressure reading of 20 mm to 40 mmHg at the transmetatarsal region indicates adequate ability to heal following toe or foot amputations. Pressure readings from the ankle may be normal yet large gradients occur between the ankle, transmetatarsal, and toe pressures should there be incomplete pedal arches or should small-vessel disease exist at the level of the foot or toes. ABI score of 0.71 to .096 suggests the presence of mild ischemia. 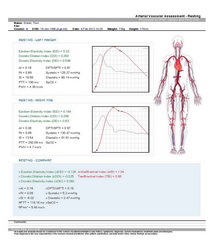 ABI score of 0.31 to 0.7 indicates moderate ischemia with minimal symptoms such as intermittent claudication in the legs. ABI score of 0.0 to 0.3 warns of severe ischemia with symptoms of ischemic pain in the legs while at rest. A pressure difference between two adjacent levels of less than 20 mmHg is normal while any pressure difference between two adjacent levels exceeding 20 mmHg is considered abnormal. 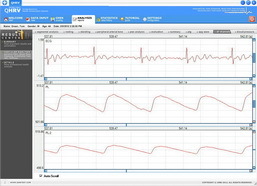 Typically, ABI is an accurate and reliable measure of arterial flow at rest. As with all measurements, there are certain patients and certain conditions that give rise to exceptional readings. For instance, some patients with hemodynamically subcritical arterial stenoses may exhibit a normal resting pressure. For these individuals, additional testing is recommended in order to locate and assess lesions. In addition, segmental pressure is compromised in diabetics and the elderly whose blood vessels are calcified and not normally compressible. Directional Doppler ultrasound is valuable in determining blood flow in these scenarios. 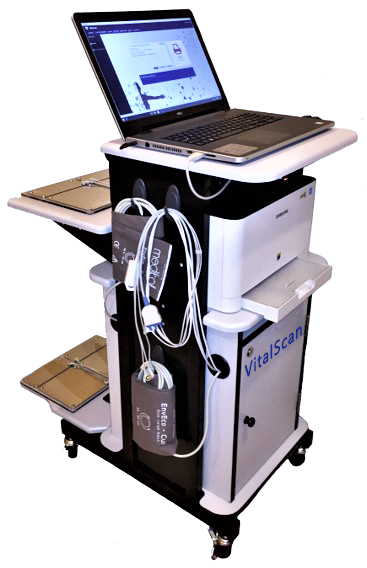 State-of-art measures for determining blood pressure via central aortic blood pressure are now readily available. These methods utilize oscillometric or tonometric readings of arterial pressure curves (brachial artery, radial artery) to generate central blood pressure measure and ultimately determine central blood pressure. The physiological relationship between blood pressure amplification and increasing arterial stiffness as associate to the arterial vascular system produces peripheral systolic blood pressure (SBP) values that average 10-15 mmHg higher than central (aortic) systolic blood pressure. This scenario is only apparent during the systole stage. Meanwhile, diastolic pressure in the upper arm and aorta remain unchanged. In addition, central SBP increases with advancing age. This increase is even more significant than the increase in peripheral SBP such that higher age produces a central SBP value that is higher than the peripheral SBP. This finding suggests the notion that with increases central SBP come an increased cardiovascular risk even when peripheral blood pressure readings are within the normal range. Recent studies concur that central blood pressure presents a superior opportunity for prognosis. For these scenarios, regardless of long-term research, , intensive antihypertensive therapy is a recommended course of action in combination with medication that widens blood vessels (ACE inhibitors, AT1 antagonists, renin inhibitors, calcium antagonists). These drug treatments promote a more substantial reduction in central blood pressure than conventional antihypertensive drugs (beta-blockers, diuretics). Exercise-induced pain in the legs and feet produce readings of absent, diminished, or equivocal pulses. This finding suggests the possibility of arterial insufficiency. In situations where the pulse reading is normal, noninvasive testing should be pursued to distinguish arterial insufficiency from other potential causes of the pain. In patients with exercise-induced leg pain, a finding of absent, diminished, or equivocal pulses is bound to raise the possibility of arterial insufficiency. When the pulses seem normal, however, noninvasive testing will distinguish arterial insufficiency from other causes of leg pain. Testing is also useful in determining the degree a disease has advanced. This application is particularly useful when symptoms (i.e. rest pain) may suggest severe conditions such as ischemia or significant neuropathy. Testing will determine the severity of the condition and provide insight into the patient’s present condition. Claudication usually produces readings for absolute ankle/brachial pressures at 70 mm to 100 mmHg, and ABI readings of 0.5 to 0.8. Patients experiencing rest pain or gangrene tend to have absolute ankle pressures of less than 50 mmHg and ABIs of 0.3 or less. Other health issues such as diabetes mellitus, Buerger’s disease and chronic renal failure may be generate pressures that are deceptively high due to calcified, stiffened vessels. The tests are also useful in locating the site of a diseased region. For instance, superficial femoral artery occlusion is typically shown in patients who exhibit normal upper-thigh pressures and Doppler tracings, decreased popliteal tracings, and decreased calf pressures. When femoral tracings are abnormal and upper-thigh pressures decrease, aortoilliac disease is suspected, however, this finding may also suggest high superficial femoral occlusions and profunda femoris disease. Using pressure gradients generated through testing, arterial occlusive disease can be pinpointed to a location between the two pulse points. The segmental pressure measurements are also useful in determining the likelihood of healing in foot lesions and amputations. Studies suggest that foot lesions heal in 76% of diabetic patients with ankle pressures of less than 55 mmHg, unless they underwent arterial reconstruction. Compare this value to nondiabetic patients whose lesions healed in 92% of those studied and in those normal patients with toe pressures of 30 mmHg or more, virtually all the lesions healed. In diabetics with toe pressures exceeding 55 mmHg, 94% of lesions healed. To conclude, conservative therapy should only be pursued in diabetics with an ankle pressure over 55 mmHg in nondiabetics and 80 mmHg in diabetics. Many studies suggest that below-knee amputation healing takes place in 88 to 100% of patients who exhibit calf pressures of 60 mmHg or higher. It is important to keep in mind that blood vessels in diabetics may be calcified thereby producing false readings. As such, planning amputation should be done with great care. One study suggests that below-knee amputations where the calf pressure was less than 55mmHg only yielded a 10% heal rate. Noninvasive testing presents a powerful option for long-term care and follow-up. Physicians are able to identify symptom changes, monitor the disease, and utilize findings to identify appropriate candidates for arterial reconstructive surgery. Following surgery, patients may be retested a regular intervals to determine if grafts are functioning properly and to identify risks or warning signs of restenosis. This monitoring leads to a timely response and any problems may be easily corrected to salvage the patient’s extremities.